48th All India Student Design Competition 2017 is giving an opportunity and a platform to the technical students to exhibit their individual engineering skills and talents in technology. The application process has been started and the candidates who wish to participate in the Competition must submit their entries on or before 5 September 2017. 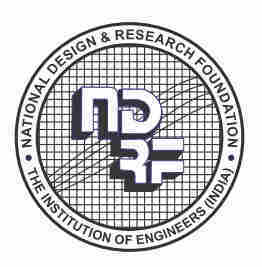 48th All India Student Design Competition 2017 is organized by National Design and Research Foundation (NDRF) since 1969 for the recognition of the talented students all over the India in the field of Engineering Design and Research in the country. The students studying in the Final Year and Pre-Final year of BE/B.Tech/ ME/M. Tech/MS or any other equivalent engineering courses is eligible to apply. The winners from each discipline will be awarded Medals and a Recognition certificate. Class/ Age Final year or Pre-Final year Engineering Students. Students studying in the Final Year and Pre-Final year of BE/B.Tech/ME/M.Tech/MS or equivalent Courses in Engineering. Students studying as Senior Technician/Technician Member of IEI, who have passed at least section-A examination of The Institutions of Engineers(India). Winners of each discipline will be awarded the Gold, Silver and Bronze Medal along with the certificate of Appreciation and recognition by NDRF. Date of Award distribution will be intimated to the awardees soon. 48th All India Students Design Competition 2017 applications are available here. Participants have to fill the online application form using pen and paper mode without any payment of entry fees. Participants can download the application form by following the link below. STEP 1: Download the application form from the link given above. STEP 2: Fill up the application form using pen and write the relevant details in each column carefully. STEP 3: Attach the enclosures given in the list and check the box for respective attachments. STEP4: Get it signed by the principal or HOD with the official seal of the College/Institutions. If a team of students has jointly done a project, the Principal/HOD should certify (Certificate of Authenticity) the role played by the student entering the competition and an account of approximate percentage of his/her contribution in the entire design of the project. STEP 5: Participants have to attach the self-declaration signed the document stating that the design project for the competition is entirely their own and also completely fill the Participant Detail Form provided. The design project of participants for the competition must not exceed 20 pages of standard A4 size (single sided). The design project must contain description about the design, brief history of the existing technology and improvements proposed and the conclusions. Participants have to submit the entries enclosed in an envelope along with the all relevant documents. Submission of the entries for 48th All India Student Design Competition 2017 is the offline process. Participants have to submit the entries via speed post or registered post or Personally handed over to the NDRF Office with due acknowledgement on or before 5 September 2017. Note: Records and Drawings submitted at the time of entry will not be returned in any case. Three top winners from each discipline will be selected by the panel of judges from respective fields for 48th All India Students Design Competition 2017. Note: The Awardees will be intimated about the Date and Venue of the Award Presentation.